This a larger version of my WWE Andre the Giant Doll pattern. This is doll when finished is about 2 feet tall. The pattern was made by easily increasing the number of stitch and rounds of all the pieces of the Annabelle Doll pattern by 50%. Worsted weight yarn: Buff, black, and white. Rw 23: Skip next 8 sc, attach black in next sc, ch 1, sc in same sc as attachment, sc in next 5 sc, leave remaining sc unworked. Finish off. Weave in ends. Place BOOTS on LEGS and sew back seam closed. Using black crochet cotton, weave through front of BOOTS to simulate LACES. Rd 2: 2 sc in next sc, holding next sc on BODY and sc #17 on RIGHT LEG together and working through both thicknesses, sc in next 2 sc, 2 sc in next 2 sc on BODY, holding next sc on BODY and sc #5 on LEFT LEG together and working through both thicknesses, sc in next 2 sc, 2 sc in next sc on BODY. Rd 32: sc in next 25 sc, holding next sc on BODY and sc #4 of RIGHT ARM together and working through both thicknesses, sc in next 5 sc, sc in next 33 sc on BODY, holding next sc on BODY and sc #16 on LEFT ARM together and working through both thicknesses, sc in next 5 sc, sc in next 8 sc on BODY. Rd 33: sc in next 25 sc, sc in next unworked sc on RIGHT ARM, working in sc behind same ARM, sc in next sc, ch 3, skip next 3 sc, sc in next sc, skip next 18 sc on same ARM, sc in next sc, sc in next 33 sc on BODY, sc in next unworked sc on LEFT ARM, working in sc behind same ARM, sc in next sc, ch 3, skip next 3 sc, sc in next sc, skip next 18 sc on same ARM, sc in next 8 sc on BODY. Rd 34: sc in next 26 sc, sc in next skipped sc on RIGHT ARM, working in sc behind same ARM, sc in next sc, ch 4, sc in next sc, skip next 16 sc on same ARM, sc in next sc, sc in next 35 sc on BODY, sc in next skipped sc on LEFT ARM, working in sc behind same ARM, sc in next sc, ch 4, sc in next sc, skip next 16 sc on same ARM, sc in next sc, sc in next 9 sc on BODY. Finish off leaving a long tail. Sew HAIR to head of BODY. Rd 25: Ch 1, turn; 2 sc in next sc, sc in next 22 sc, 2 sc in next sc, ch 8, working in free loops of foundation ch, 2 sc in next ch, sc in next 22 ch, 2 sc in next ch, ch 8, slip st in first ch. Finish off. Weave in ends. Flatten and mark center of underarms. Finish off leaving a long tail. Sew Rw 26 of FRONT and Rw 26 of BACK together. Weave in ends. 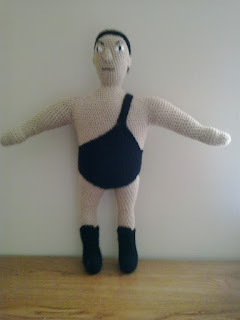 Andre the Giant and WWE are copyright World Wrestling Entertainment and their respective creators.